The 58 Piece Eternal Cutlery Set is a fantastic Star Buy from Belleek Living. This beautiful Polished 18/ 10 Stainless Steel cutlery is perfect for a wedding gift, housewarming gift or for everyday use in your own home! Lovely solid elegant pieces. Good for casual or more formal dining. Always looks good. Really pleased with this purchase. Bought as wedding present and then bought for myself. We needed Cutlery quickly for a Christening. 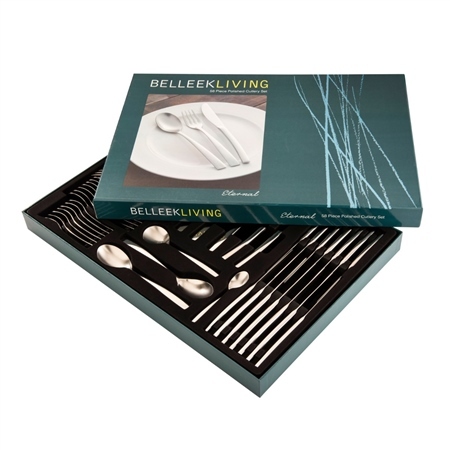 BeleekLiving was the nicest cutlery set we saw. Ordered on a Tuesday and goods arrived on the following Thursday. Cutlery has a nice weight and feel. Exceptional value and service from Belleek.